First off, I was one of the two winners of the Farmer's Wife in Your Life contest over at Love Affair with My Brother with my Century of Progress potholder. I get a fabric bundle! Yay! 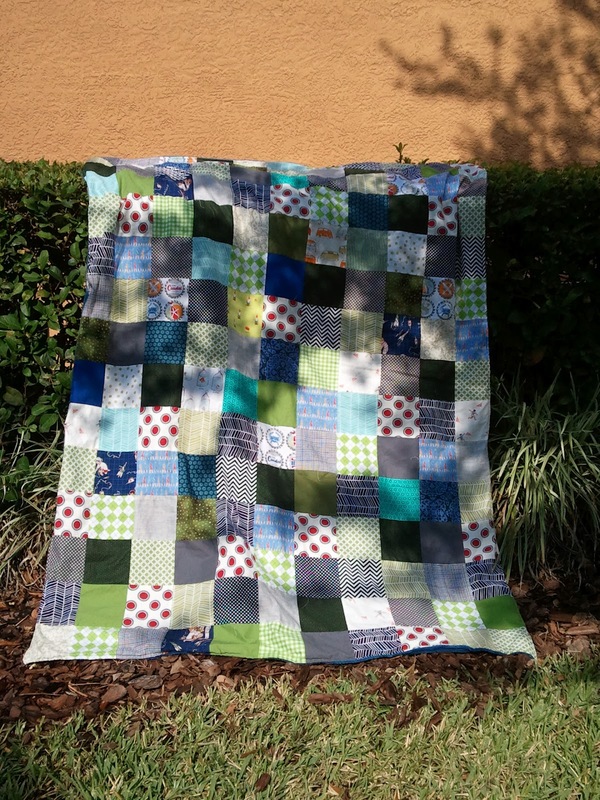 I'm so excited, as this is the first time I've won anything in the quilting community, be it a contest or a giveaway. Today I had planned on showing my completed Ruby triangle quilt that I gave the sneak peek of earlier this week. 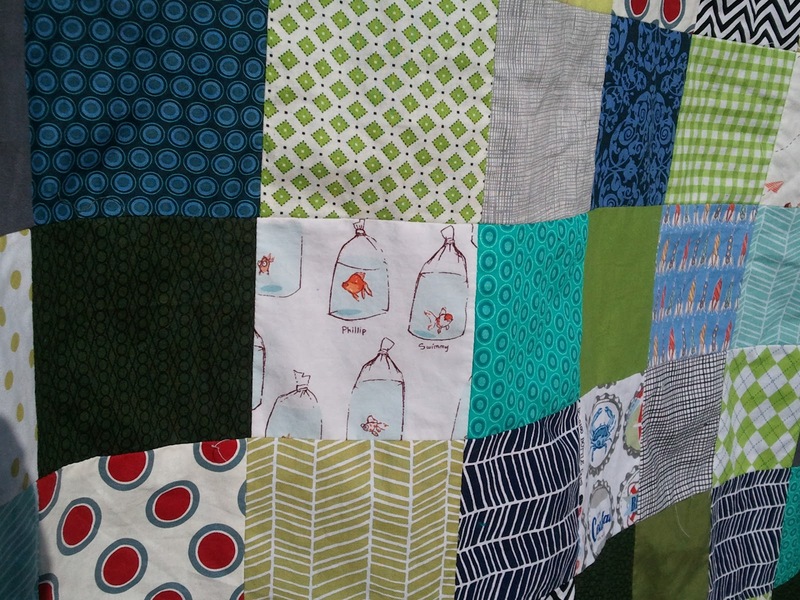 As I was heading out the door I saw the quilt I finished up for Stephen for Christmas [that I finished in March]. 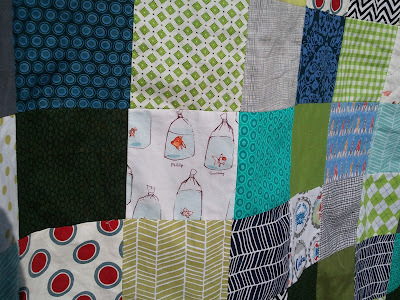 And felt bad that the Ruby quilt was getting her 15 minutes of fame before this other quilt. 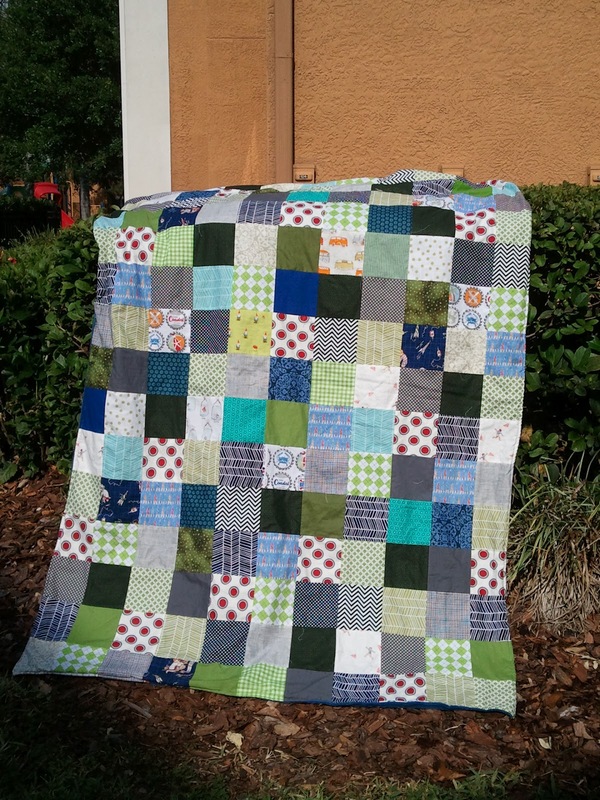 The squares finish at 5" square, and the fabrics were pretty much all the [manly] greens/blues/grays/and some white patterns that I had on hand. Fabrics include: DS Quilts, Oval Elements, Hullabaloo, Going Coastal, Kona solids, Alexander Henry Heath, Children at Play, Anne Kelle Remix, Secret Garden, Modern Meadow, and some other random stuff thrown in. It measures about 55x80". And one charm square of VW buses! Stephen drove a yellow 1973 VW Bug when we first started dating. It was built by his dad and Stephen kind of inherited it. Definitely a conversation starter, as it was tiny, and Stephen's 6'4, so people would always chuckle when he unfolded himself from the car. 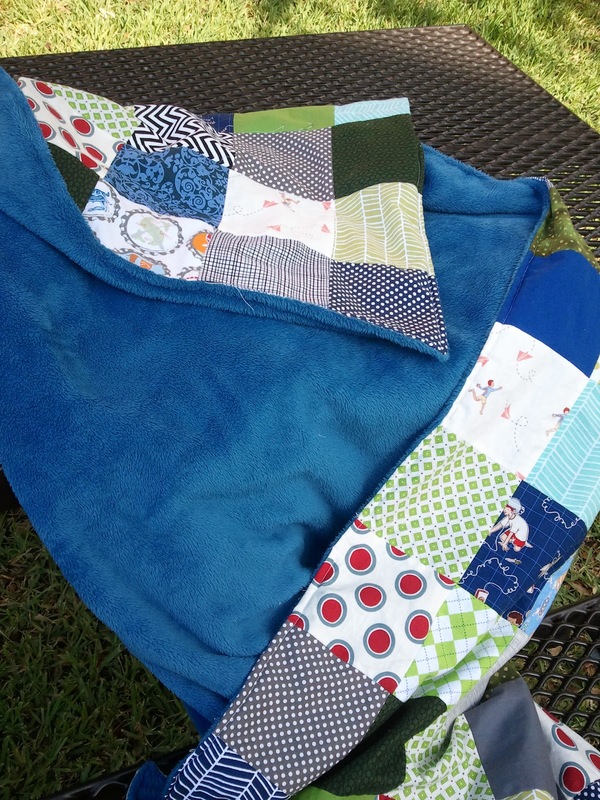 So while it is technically done, and already snuggled frequently, it's not quilted. I backed it with this cuddly stuff that isn't minky, but kind of the same idea. I stitched right sides together and then turned it. Despite thinking I was meticulous in laying it all out, it seems the backing is larger than the quilt top. So when I tried to do simple straight-line quilting, by the time I got to the end of one line a whole bunch of backing fabric had pooled, leaving a giant bubble. I've already taken the backing off and thought I had fixed the problem. 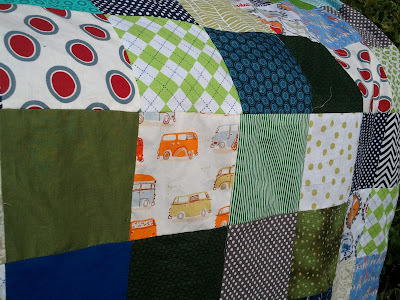 I was thinking about tying the quilt, but I don't think I really like the look of that. Any ideas for how to make this all work out? Ideally I won't have to take the backing off again...I hope. Really really hope. I like the red added in here and there! Love those charms...sometimes simple is really best. I do a lot of straight line quilting myself, so that would be my choice for this. Great job! I like some tied quilts. And my husband loves his. For some reason, it's manlier to him. Whatever, I say. But it might work. And I had a 73 Superbeetle as my first car. We were a VW family.